Manila is known for its energetic nightlife, shopping, and being one of Asia’s coolest indie music scenes. If you planning for a trip to the beautiful Philippines’s city, get your Manila flight tickets booked at Rehlat. Be assured of lowest airfares and huge discounts on every one way and round trip Manila flight booking. Get signed up for the newsletter and be among the privileged few to receive alerts on deals for Manila flight booking. 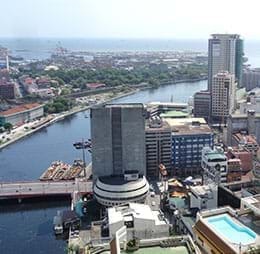 Manila, the capital city of Philippines is the world's eleventh largest metropolitan area located on the eastern shores of Manila Bay. This city hosts everything right from incredible attractions to exciting nightlife, shopping, sports and more. The major tourist attractions of this city are museums and churches. Out of these the most famous ones are National Museum, San Agustin Museum and University of Santo Tomas. Churches are the other major attractions of the city. Manila is well-known for its own unique style of shopping in the country. There are lots of shopping destinations one can find in almost every corner of Manila. Experience hectic shopping in the city with numerous shopping centers like Alabang Town Center, Festival Supermall, Glorietta, Greenbelt, Gateway Mall, Robinsons Place Manila, Power Plant Mall, Robinsons Galleria, Shangri-La Plaza, SM Aura Premier, SM Supermall, Tutuban Centermall. Manila offers lots of different dining establishments from top-class to mid-range to budget restaurants. The best hotels in manila are: Pan Pacific Manila, Amelie Hotel Manila, Sofitel Philippine Plaza Manila and The Peninsula Manila. Manila boasts of all modern means of transport like light rail, commuter rail, rapid transit, buses, taxis, and Ferries. It’s better to hire taxis to travel around the city. Ninoy Aquino International Airport is major airport in the city, which is just 7 kilometers away from the city. Manila International Airport is major international gateway for passengers to travel to Philippines, which also serve as a hub for Cebu Pacific, AirAsia Zest, AirAsia Zest,Philippine Airlines, Tigerair Philippines, AirAsia Zest, and Philippines AirAsia. Manila Airport consists of five terminals such as Terminal 1, Terminal 2 (Centennial Terminal), Terminal 3, Terminal 4 (Manila Domestic Passenger Terminal), and Terminal 5 (Budget Terminal). Passengers can find many transport facilities like buses, taxis and metro rail to reach the Manila International Airport from different parts of the city. It is recommended that passengers need to pre-book a taxi to reach the airport on time.